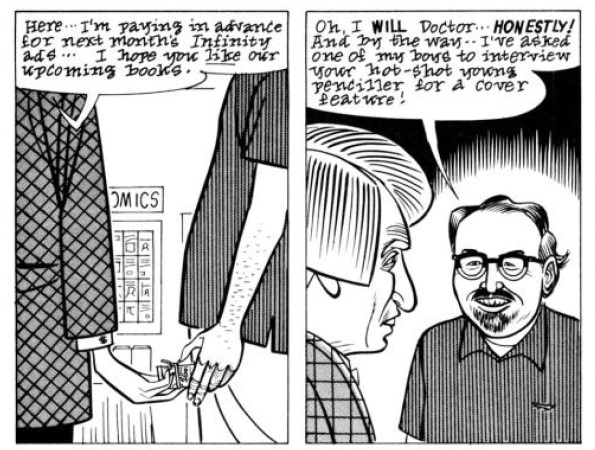 I don't think he should be so hard on himself: this is a surprisingly accurate skewering of the industry not only as it was then, but had been for years, with some side-swipes at the easily bought - sorry, SPONSORED - Comics Buyers Guide; Stan Lee (the way in which he ran Marvel Comics back in the 1960s and the way in which those veterans continued to be treated at conventions until recently); the original Image Comics crew... and even Fantagraphics' co-publisher Gary Groth makes a brief but verbose appearance as Mr. Anger. But it's more complex than that. Just like Feb 2019's CRIMINAL #2 (which too takes place in the comics world) with few exceptions you can't really say, "This is him, this is her" etc. They're more embodiments of common attitudes and behaviour in the industry and without: the lessons here about pride, fall, fame being both fickle and fleeting, treating people on the way up then being treated on the way down... They're timeless. I may be missing something, but I certainly can't pin buck-toothed Dan Pussey down as any artist in particular. 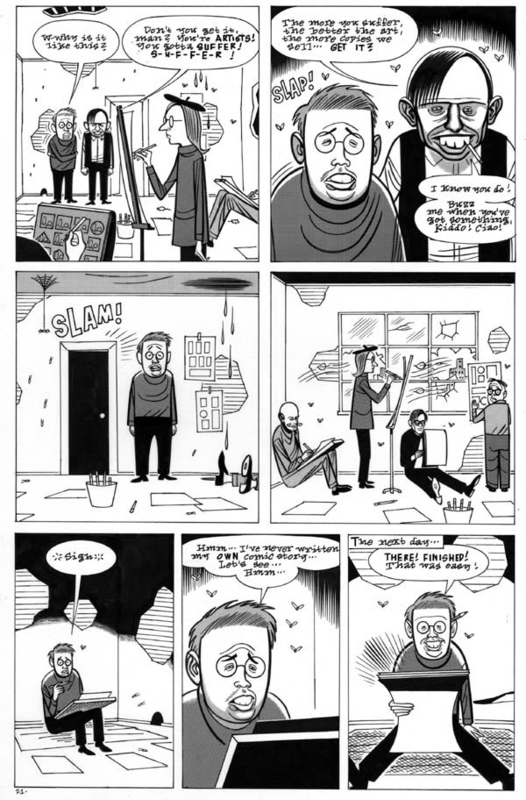 And I wonder if Chris Ware was thinking of the narrative structure here when he began to offer up pieces of 'Rusty Brown', because it does dot backwards and forwards in time, gradually revealing what made Dan Pussey into the repressed man-child and hackneyed superhero artist who eventually becomes comicbook king... for a year. If you've ever heard of superheroes being referred to as male power fantasies and didn't quite know what was meant by that, this is the definitive explanation with 'The Origin Of Dan Pussey' providing an uncomfortable portrait of a weak and unsociable child with daydreams of revenge as one of the superheroes he draws badly: "I'll crush you all like ants!" Like Evan Dorkin in THE ELTINGVILLE CLUB, another classic stab at the less salubrious aspects of a superhero-dominated US/UK industry - Clowes is more even-handed than you might expect, because the pretensions of the Fine Art Gallery crowd come under fire as well, and my favourite scenes were those set in the world of the wilful obscurists, a collective published by Emperor's New Clothes Magazine ("Look how much it costs -- they must pay higher page rates!") 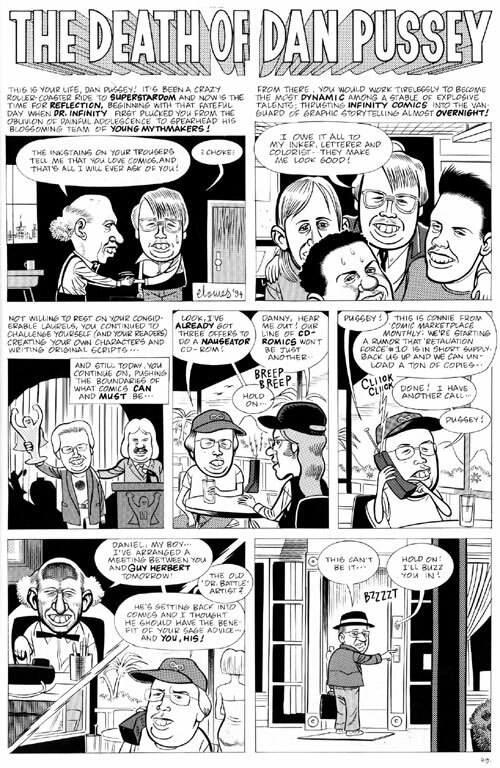 whose editor is as rapacious and slimy as the superhero hustler who cons his crew to work for nothing. In fact the entire book is about money and using people. "Welcome, my boy, to the editorial offices of Emperor's New Clothes Magazine: The moderne, avant-garde, neoexpressodeconstructivist Compendium of Comics (or, as I like to call them, Kommix). I am Gummo Bubbleman: Editor, Emperor, Enfant Terrible. Did you bring any samples of your work, or are you just here to waste my time!?" "No... I - I figured you'd have seen it... I'm Dan Pussey!" "Pussey? ...Pussey? ...No, can't say that I have. Tell me, Pussey... why do you want to work for me?" "Eh... well... I ... I... eh..."
"So! You're a snivelling little coward! Excellent! That's a quality I admire in an artist!" "Pussey, this is really first rate work! You've captured the primitive essence, the crude vitality of derivative, mindless slop! It's really quite an achievement! You've got keen sensibilities to be able to recognise and deconstruct the various trite and mundane clichés inherent in the common comicbook... and to lay them bare in such an artless and... and venomous way!" "I-It was s'posed to be kinda like Batman crossed with Star Trek..."
I've just typed "Not a single pair of which suits the one wearing it" and realised for the first time ever that we refer to a singular set of glasses as a pair, as in plural, and it has confused the linguistic / syntactical hell out of me. I guess it's because there are two lenses...?